That is the basic pop up message from Microsoft to all XP users when they stopped providing free updates to the venerable XP operating system. The question for most users now is what should I do about it. Firstly it is important to understand the meaning of this “End of Support” message. While your Microsoft XP computers will continue to work just fine after the 8th April 2014 they will no longer receive the regular security updates from Microsoft, a free service which they have now been offering for over a decade and, arguably, have every right to withdraw for such an old operating system. While this may sound alarming, operating system security updates are only part of your overall computer security and while computers with XP will no doubt be less secure than more recent editions of Windows like Windows 7 or Window 8, it does not mean you have to throw out your Xp machine and go straight out and buy a brand new machine. Upgrading to Windows 8 is the option that Microsoft would like you to do. 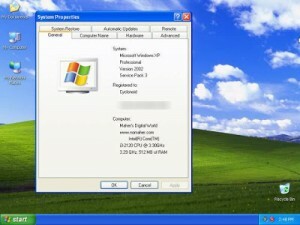 Many computers that currently run Windows XP can be upgraded to Windows 8 but whether this option is available for your particular machine would have to be checked. We can advise you on whether your computer or laptop can be upgraded to windows 8 and what, if any, other upgrades should be made to take full advantage of the latest operating system. If your operating system is more than 7 years old (as most XP computers are now) then not only will the operating system be out of date but many of the parts inside your computer will be slower and less efficient than their modern equivalents. In this case there is a case to be made for updating your whole computer to a more modern machine, we can consult with you about your specific computer needs, what kind of programs you run or would like to run in the future, how much storage space you need and what other features would be useful to you such as screen size, wireless, touch screen, Bluetooth etc. This will ensure if you do decide to replace your XP machine with a new desktop or laptop computer, you will be getting a machine suited to your needs and to your budget. If the expense of upgrading your computer, or buying a new one, is too much for you, or you are just happy with your computer as it is and would just like it to remain safe and secure there are a few things that can be done to keep you working safely. We offer a Home PC health check to our customers in and around the Sutton Coldfield area and as part of this service we will check all of your security settings and software and also advise you on how to use your computer in the safest way possible. Just contact us to arrange a visit. Whatever your situation we can help you ensure your computer stays safe, up to date and secure.